Irrational Games, the studio behind BioShock and other well-respected games, was shut down earlier this year. Now, we’re starting to see the first projects take shape from small teams that formed in the wake of Irrational’s collapse. Two such games made their way to Kickstarter this week, and one of the few things these wildly different games have in common is their ambition. 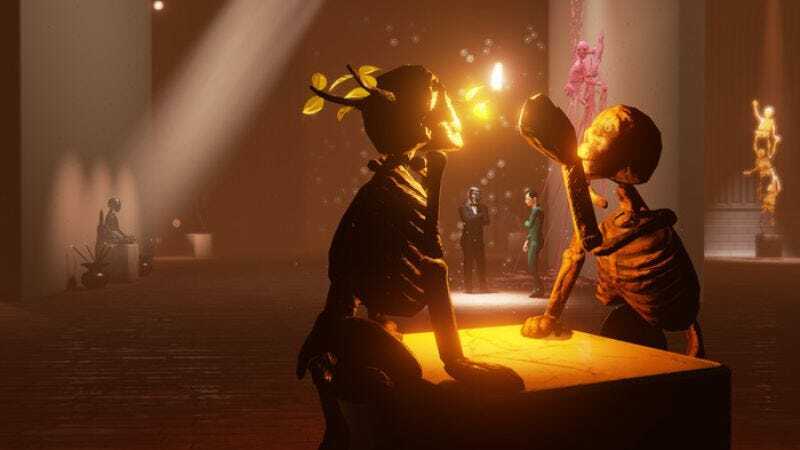 First, there’s The Black Glove from Day For Night Games, which is made up of Joe Fielder (BioShock Infinite’s co-writer) and a ton of former Irrational artists. This explains why it has inherited so much of BioShock’s visual aesthetic. It takes place in The Equinox, a 1920s theater that’s home to three artists-in-residence and dimension-bending activity. The artists have fallen on hard times, and you must reach into their pasts to manipulate their “medium, message, and muse” (using a magic glove you win by playing arcade games) in the hope of altering the art they create in the present and satisfying the critics. In one example from the Kickstarter video, The Equinox’s musical act, Many Embers (a real band whose frontman is contributing music to the game), has their sound changed from upbeat indie pop to laidback honky-tonk after having their muse switched. Day For Night is hoping to raise $550,000 by November 7. As of this writing, the campaign has brought in approximately $63,500. The second post-Irrational game to hit Kickstarter is called The Flame In The Flood. This one comes from a team going by The Molasses Flood, whose collective credits include BioShock, Halo, and Rock Band. It’s a game about surviving a trip downriver in a world inspired by backcountry America that the developers say “explores what happens on the fringes when civilization gives up the ghost.” It’s a procedurally generated affair, so the river, its islands, and the people and dangers you come across will be stitched together on the fly every time you play. Taking some cues from Oregon Trail and recent survivalist game outings, your traveler will battle the wilds and stave off predators and disease alike. If you succumb, you’ll have to start the journey all over again. Alt-country singer Chuck Ragan (whom The A.V. Club interviewed earlier this year) is putting together an album of new music that will act as the game’s soundtrack. Molasses Flood is looking to bring in $150,000, and as of this writing, has raised just more than $64,000.